The Northside Oktoberfest benefiting Iowa City area nonprofits showcases the Bohemian nature of the Northside Marketplace with great craft beers, neighborhood food, beer games and much more! Join us on Saturday, October 5th, as we take over the streets of the Northside, just blocks north of downtown Iowa City. This is an open festival, ANYONE can come in and enjoy the atmosphere, food vendors, activities etc. ONLY those with tickets will be allowed the tasting glass that will allow them to sample beers, ciders and wines from over 65 booths. 10:00am – SodaFest begins. Ticketholders can start getting wristbands and their ID’s checked. 11:00am – BrewMaster ticket holders can pick up their glasses. 11:00am – Blessing of the beer. 11:00am – 3:00pm – Adult games (Hammerschlagen, Beer Slide, Keg Bowling, Giant Jenga) in the Lawyer Lot between El Banditos and High Ground Cafe. 12:00pm – General Admission ticket holders can pick up their glasses. 12:00 – 2:00pm – Die Tieffen Keller performance in City Lot/Biergarten. 1:00 – 2:00pm – Juniper Brothers performance outside High Ground Cafe. 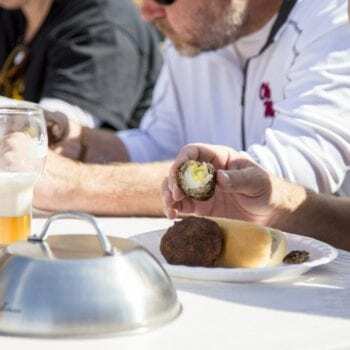 2:00pm – Brat and scotch egg eating contest in Lawyer Lot next to El Banditos. 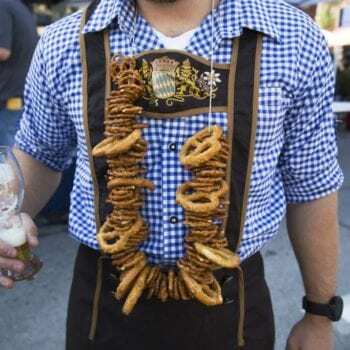 Lederhosen costume contest to follow. 2:00pm – BrewMaster ballots for Real Ale contest must be turned in by this time. Submit ballots at Volunteer Booth outside of El Banditos. 2:00 – 3:00pm – LIttle Monsters performance in City Lot/Biergarten. 2:00 – 3:00pm – Cedar County Cobras performance outside High Ground Cafe. 3:00pm – Taps close and Northside Oktoberfest/Iowa City BrewFest ends. 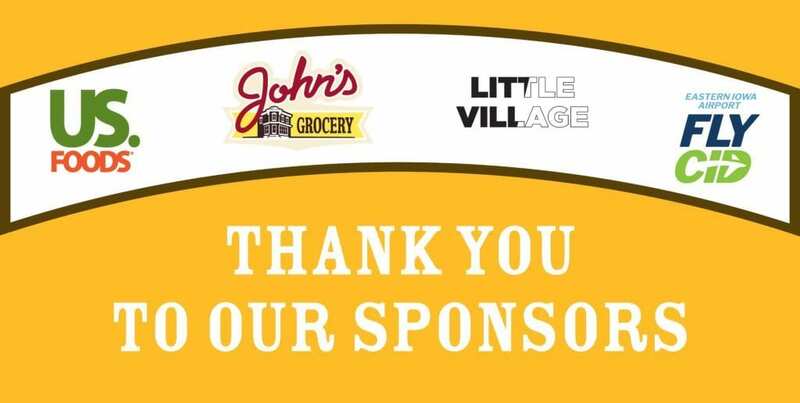 This event wouldn’t be possible without your support: U.S Foods, John’s Grocery, Little Village Magazine, Eastern Iowa Airport – Fly CID. 10am-3pm in the Pagaliai’s Pizza Parking Lot. Take part in the football toss or basketball shootout, climb the rock wall, take a few rides down the big double lane blowup slide or dance with all the great performers! The Iowa Children’s Museum will also be there facilitating many different fall craft activities. SodaFest is open to all ages. $5.00 ticket includes specialty acrylic tasting soda glass and soda drink tickets. SodaFest will be located in Pagliai’s Pizza parking lot and on N Linn St.
Do I have to be 21+ to attend Northside Oktoberfest? I plan on drinking a lot and shouldn’t drive home. Who can give me a ride home? Do I need to buy a ticket to drink at Northside Oktoberfest? Why is there a line at the entrance of the festival? What else can I do besides drink? Are there Designated Driver tickets available? No, this is an all ages event. However, you must be 21+ with a valid ID and a General Admission or BrewMaster ticket to consume alcohol at the event. We have never, not ONCE ran out of parking in Iowa City! There are thousands of parking spots at our 5 major parking ramps, we suggest the Tower Place ramp, just a block away and it’s only $1/hr and your first hour is FREE!! There are plenty of taxi companies, as well as Uber, in Iowa City that can safely get you where you need to be. Northside Oktoberfest does not support, condone, or encourage drunk driving at all. Please make a responsible and smart decision and take a taxi or Uber home or arrange a ride from a sober friend if you are impaired. Yes, you must purchase a General Admission or BrewMaster ticket. We have an open festival design, allowing those who choose not to drink to participate in non-drinking festival activities without a ticket. 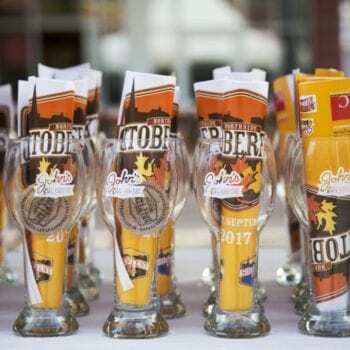 Many beer enthusiasts line up well in advance for the festival, and there will most likely be a line at the entrance to Northside Oktoberfest. An ID check of all who enter is required. The line will move quickly if you have your ID out to make the age verification process run smoothly. 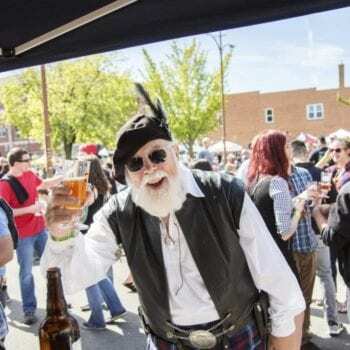 If beer isn’t your thing, there is still plenty to do at the Northside Oktoberfest. We’ll have SodaFest featuring a variety of craft sodas, food vendors, and a rock climbing wall for the kids. Other activities include hammerschlagen, keg bowling, and beer slide! Yes, this is a family event. We have a children’s area equipped with a children-sized rock wall and SodaFest for those who aren’t of age or do not want to drink. They do not need to purchase a ticket if they are not drinking. Sure, but it has to be on a leash and we have to check its ID if they want to drink. Just kidding, you shouldn’t give your dog beer but Fido is still welcome at Northside Oktoberfest as long as he is leashed. No. Since the festival is an open festival, you don’t need a special Designated Driver ticket to enjoy alcohol-free fun.